I had not found the occasion of impetus to kick-off this blog until now. But today is a notable enough day, being the effective start of Run 2 at the Large Hadron Collider at CERN. The LHC is back in business. The 6.5 TeV proton beams are going and the experiments are taking data. I had not found the occasion of impetus to kick-off this blog until now. But today is a notable enough day, being the effective start of Run 2 at the Large Hadron Collider at CERN. The LHC is back in business. The 6.5 TeV proton beams are going, and the experiments are taking data. The following is a screen shot from the LHC Page 1, where you can monitor the status of LHC on the web realtime. I’ll try to explain these plots, as they are kind of hard to parse because they show multiple things. 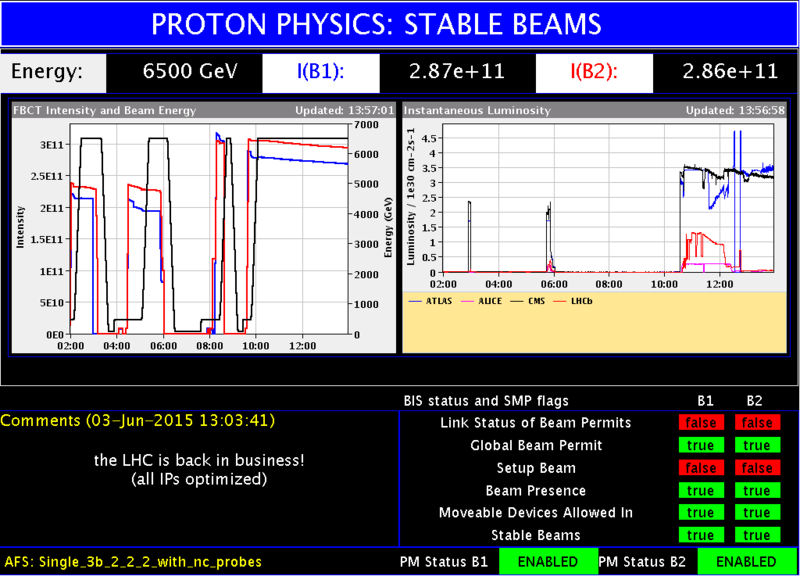 The LHC beam monitoring page, “LHC Page 1”, on the day of first 13 TeV collisions with stable beams for Run 2. The plot on the left shows the energy of each proton beam in black. One beam goes one way around the ring, and the other, the opposite way, but they are always ramped-up together to have the same energy. Here each beam achieves 6.5 TeV of energy per proton, so that the combined collision energy per proton is 13 TeV. In red and blue you see the intensities of each beam expressed as a number of protons per beam. In this case each beam has 3 bunches of protons with protons in each bunch so each beam has protons. You can see several periods this morning where they had beams and then dumped them, but beginning around 10 am, the blue and red lines climb up, indicating that beams were refilled with protons, and shortly after the energy was ramped-up, where the black line rises, from the 450 GeV of energy that protons have as they are injected into the LHC from the SPS, up to the current max energy of the LHC: 6500 GeV or 6.5 TeV. 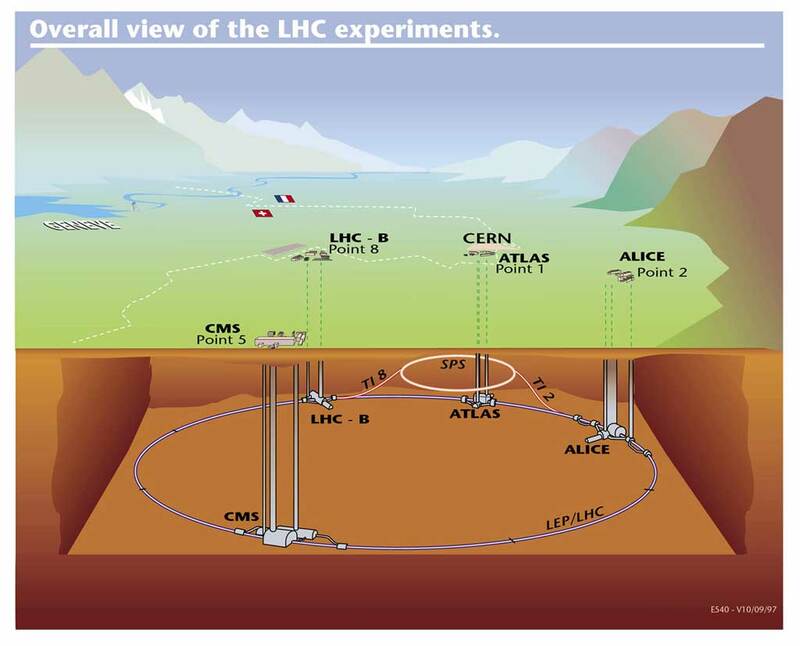 Then the plot on the right shows the instantaneous luminosity delivered at each of the four collision points around the ring, where the ATLAS, ALICE, CMS, and LHCb experiments are. Luminosity is a measure of the number of protons squeezed to pass through a small cross sectional area in the center of each experiment, per area, per time. This instantaneous luminosity is directly proportional to the rate of us producing any particular physics process, so it is proportional to the data rate of interest we are taking. In this case the instantaneous luminosity is . During Run 1 of the LHC (2009-2012), the collider improved in performance substantially, achieving a peak instantaneous luminosity of in the later half of 2012. But that was at a total collision energy1 ( ) of 8 TeV, and the LHC is now back online at a higher energy of 13 TeV. This higher energy raises the production rates of many interesting and hypothetical physics processes, giving us a much larger reach to search for new physics. Changes in the peak instantaneous luminosity of the LHC over time in Run1. In future runs of the LHC in the coming weeks, eventually each beam will be filled with a few thousand counter-rotating bunches instead of just 3 per beam, and the beams will be squeezed to collide in smaller cross sectional areas, which together will drive the instantaneous luminosity to some – , which will open the torrent of interesting data by a few orders of magnitude of what is achieved today. 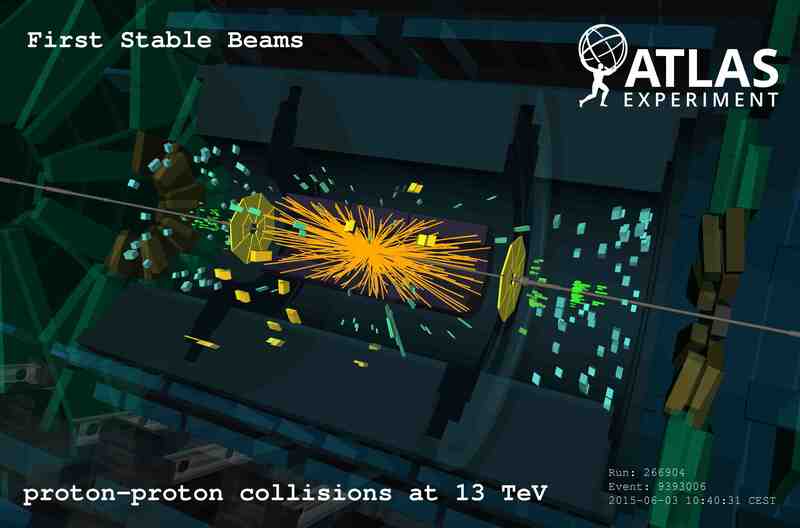 A special milestone today, since we had 13 TeV test collisions already some days ago, is that the LHC declared “stable beams” as indicated by the green boxes in the bottom right of LHC Page 1. This means that the innermost parts of the tracking detectors, being silicon-based and the most sensitive, can have their high voltage settings safely turned up to nominal operation because the LHC is confident they have tight control of the beams and that no stray particles in the orbiting beams could get dangerously sprayed, which could saturate and damage our detectors instead of allowing them to safely detect the collision products. This is a prerequisite for the silicon-based tracking detectors to start recording the data, which they are doing now. This is the beginning of a lot more data and a lot more searching. If there weren’t reason enough for the physicists at CERN to get their analysis software rocking, we have it now. ATLAS event display from first stable beams in Run 2 on 2015-06-03. If you’re wondering what’s going on with the ATLAS luminosity, especially why it does this weird dip just before noon, it’s because the BCM – the device used to produce the particular measurement you see on this plot – was performing adjustments that are simply not possible in the absence of stable beams. It means the luminosity we reported live isn’t super accurate. However, we measure luminosity in tons of different ways. For analysis, a different measurement will be used for this particular first run. It’s probably far from the only problem with the run as far as data-taking at ATLAS is concerned however, but as you say, it’s very little data compared to what we project to accumulate. All of ATLAS will achieve much greater robustness in the coming weeks, now that we can do in-depth diagnostics using the real data. Science is a way of getting at reality.